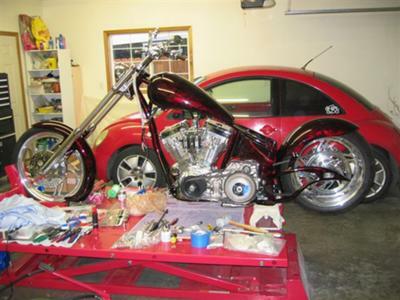 Picked up a Big bear Chopper kit, mocked it up, disassembled and sent to paint at jeillusions in Eugene Oregon. Doing the final assembly but going slow. deployed for 6 months now. Engine package from Southern Motorcycle Works, 103 ported and polished 6 speed Ultima. The paint job is named adromina on the jeillusion web site.